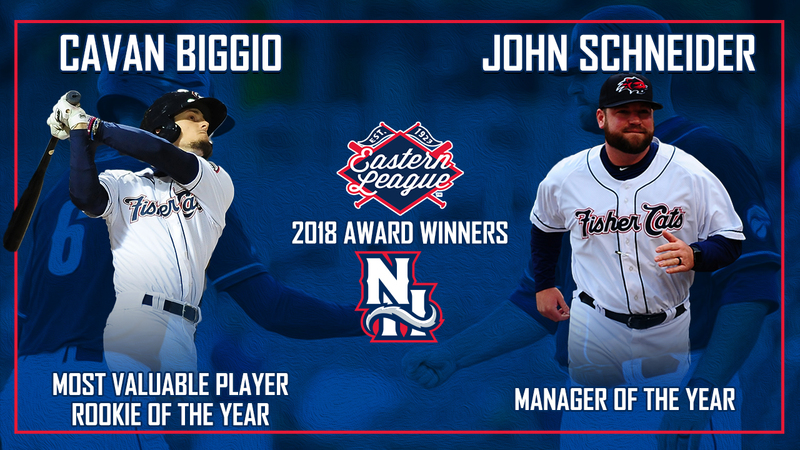 Manchester, NH - The Eastern League has announced that New Hampshire Fisher Cats (Toronto Blue Jays Double-A affiliate) 2B Cavan Biggio has been voted league MVP and Rookie of the Year, while skipper John Schneider has been voted Manager of the Year. Biggio becomes the first Fisher Cat ever to win the Rookie of the Year award, and is the first player since Travis d'Arnaud in 2011 to earn MVP honors in New Hampshire. He is the first player to win both awards in the same season since Darin Ruf of the Reading Fightin' Phils (Philadelphia Phillies) in 2012. The awards are voted on by Eastern League managers, coaches and media members. In the MVP voting, Altoona Curve (Pittsburgh Pirates) 1B Will Craig finished as runner up, and Fisher Cats 3B Vladimir Guerrero Jr. finished in third place. On the Rookie of the Year ballot, Fisher Cats SS Bo Bichette finished in second place, while Guerrero placed third. Biggio, the son of Hall of Famer Craig Biggio, leads the league with 26 home runs, 99 walks, a .393 OBP and a .902 OPS. He ranks second with 98 RBIs, and places among the circuit's top 10 with 20 stolen bases. The Mid-Season and Full-Season All-Star has already set the Fisher Cats single-season record for walks, and is one home run and six RBIs shy of Eric Thames's 2010 records. Biggio is now ranked No. 9 among Blue Jays prospects by MLB.com, after being unranked to begin the season. Past Eastern League MVPs include Jeff Bagwell (1990), Vladimir Guerrero (1996), Kevin Millar (1997), Victor Martinez (2002) and Ryan Howard (2004). John Schneider, the youngest manager in Fisher Cats history (38) and a two-time MiLB Champion with Short-Season Vancouver and Advanced-A Dunedin, earns his first career Manger of the Year award. In his first Double-A season, the former Fisher Cats catcher led New Hampshire to its first playoff berth and winning season since 2011. Even with the injury and promotion of top prospect Vladimir Guerrero Jr., the team has held at least a share of first place in the Eastern Division for 120 out of 136 games this season, and has paced the Eastern League with a franchise record .272 batting average. New Hampshire's 40 road wins are tied for the most in Fisher Cats history, and they've used a franchise record 31 different pitchers this season. Past Manager of the Year honorees include Buck Showalter (1989), Chris Chambliss (1990), John Gibbons (1998), DeMarlo Hale (1999), Torey Lovullo (2005), and Sal Fasano (2011). The Eastern League Playoffs begin on Wednesday, September 5. Currently in a tie for first place with the Trenton Thunder (New York Yankees) the Fisher Cats' magic number to clinch home field advantage is four, with three regular season games to play. With home field, New Hampshire would host Round 1 playoff games on Friday, September 7, as well as Saturday, September 8 and Sunday, September 9 if necessary. The first two games will be hosted by the Eastern Division runner up. For tickets and information, visit NHFisherCats.com.